Stuart Broad struck twice before lunch but India looked on course to seize control of the fourth test against England as they reached 100 for two at Southampton’s Ageas Bowl on Friday. India began hoping to build on a largely dominant opening day in which they had England rocking on 84-6 before Sam Curran’s 78 helped the hosts to respectability at 246 all out. From an overnight 19-0 India moved smoothly to 37 before Broad dismissed opener KL Rahul lbw for 19 — trapping him on the back foot with a delivery that speared in. Fellow opener Shikhar Dhawan had made a watchful 23 but Broad’s persistence paid off when he tempted him to prod forward to a juicy full-length outswinger and the ball was edged behind into the grateful gloves of keeper Jos Buttler. 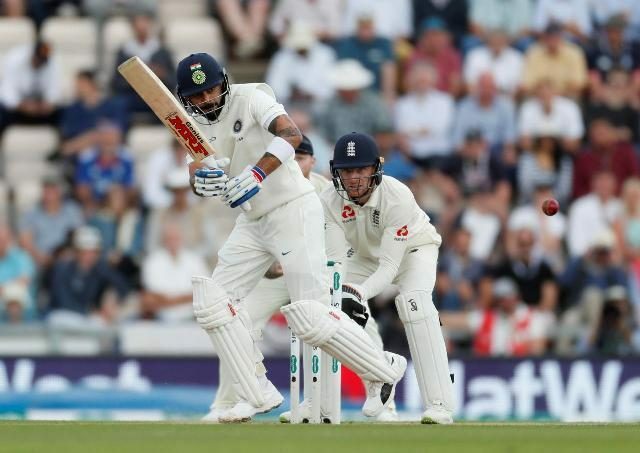 With India on 50-2 England glimpsed an opportunity to battle back into contention after their first-day batting woes but, not for the first time, Virat Kohli looked a class apart as he made batting look easy on a tranquil pitch. In tandem with Cheteshwar Pujara the India skipper took the score to 100 for two at the interval to make it India’s morning. Kohli looked in ominously good form as he took his test tally past the 6,000 run mark, striking four boundaries as he reached the interval unbeaten on 25 from 40 balls. Pujara was on 28 as India moved to within 146 runs of England’s first innings score. Broad finished the session with figures of two for 34 from 10 overs as skipper Joe Root utilised six different bowlers to try and make inroads into the India top order. Moeen Ali joined the attack in the last over before lunch and there were some encouraging signs of spin. India lost the first two matches of the five-test series but after winning at Nottingham are aiming to set up a series-decider at the Oval next week.